Posted April 8th, 2019 by Matt Doll. In the middle of a contentious but exciting state Legislative session, Minnesotans from around the state have an opportunity to shape our state’s work to protect and provide clean water for all of us. 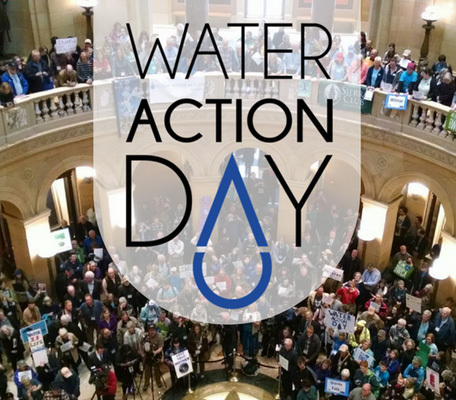 On April 10, Water Action Day at the State Capitol will provide a chance to tell legislators, state agency leaders, and media that Minnesotans care deeply about programs and policies to keep our water healthy and safe. Hundreds of people have already registered to attend, and we expect next Wednesday to build on the success of the previous two years and drive real change at the Capitol. Minnesota’s reputation as a land of clean water – with 10,000 lakes, the mighty Mississippi, and Lake Superior – is well-deserved. But it isn’t the full picture – 40% of our surface waters are considered unswimmable, unfishable, and undrinkable. Thousands of wells across the state are contaminated by nitrate from crop runoff, putting Minnesotans’ health at risk. And our waters face increasing threats from sulfide mining, oil pipelines, and climate change. This is a moment of big challenges and equally big solutions. This legislative session has featured some of the most exciting legislative proposals we’ve seen in years. Bills are moving to fund the Forever Green Initiative to bring the next generation of crops to Minnesota lands – crops that clean water, restore soil health, and sequester carbon. And for the first time, the legislature is considering establishing a clean water goal to make all of Minnesota’s waters swimmable and fishable by the year 2040. We encourage any Minnesotan, regardless of specific knowledge of policies, to come to the Capitol and meet with legislators on April 10. At the Water Action Day home base at Christ Lutheran Church across the street, we’ll be conducting trainings and sessions on clean water issues, lobbying skills, and how to be an effective advocate. We’ll also be scheduling groups of attendees to meet with their legislators. Breakfast and lunch will be provided for free. Audience members will be able to submit questions for Orenstein to ask these agency leaders. And at 2:00, we’ll gather for a rally in the Capitol Rotunda to send lawmakers the message that Minnesotans demand action to protect our water. We encourage those who can’t attend earlier in the day to join us for this always electrifying event to make our voices heard! This event is free and open to all, and we encourage our readers to join us – because this is our moment to put Minnesota on the path to 100% clean water.